As researchers, policy makers and educational practitioners have experimented with numerous strategies for raising student achievement, it has become increasingly clear that the biggest challenge we face is in our efforts to reform high schools. Several studies have shown that it is possible to significantly raise student achievement in literacy and math in elementary school through the adoption of a variety of reforms and interventions, when they are well implemented (Fashola and Slavin 1997). There are of course, many school districts where consistent gains have not been made, but in communities as dispersed as Compton and Sacramento, California, Houston and El Paso, Texas, and Charlotte, North Carolina, where progress has been made and the gains have been sustained and significant (Council of Great City Schools 1999). Given the vast resources that have been expended over the last decade to improve the nations schools, such news is encouraging. At last, educational reform seems to have brought about more than superficial changes driven by the latest fad in curriculum or school organization. Though test scores are limited measures of how much a child has learned or how much they can do, in several communities scores are rising, and for the first time it appears as though we may be in the midst of a genuine and lasting rise in student achievement. However, when we cast our gaze at the nations high schools, the picture is far less optimistic. Drop out rates, especially for Latinos, are high and the figures reported by school districts more often than not under estimate the extent of the problem (National Education Association 2000). In several states that have implemented exit exams as a requirement for graduation, large numbers of students are at risk of failing and leaving school without a diploma (Civil Rights Project 2000). Not only is there little evidence that the majority of students are making academic progress, but in many schools violence, poor attendance, high teacher and principal turnover, further exacerbate the problems that be-set public high schools. Five years ago, I initiated a comprehensive research-based reform at a large urban, public high school with a team of researchers and practitioners in Berkeley, California. Before commencing our work we conducted a national survey in an attempt to identify high schools with similar characteristics that were academically successful so that we might learn from them. Several potential candidates were brought to our attention, however as we looked closer at each of these, it turned out that none of them had found ways to eliminate the achievement gap: the wide disparities in student achievement that are manifest along racial and socio-economic lines. Since that time, I have continued to search for examples of successful high schools; places where the majority of low-income students of color are achieving at high levels. As a result of my search I have found a small number of schools that meet this criteria -- Far West High School in Oakland, Ca, Snowden High School in Boston, Ma, El Puente Leadership Academy in Brooklyn, NY. (This is by no means an exhaustive list of successful high schools) Interestingly, though each of these schools differs significantly with respect to its organization, curriculum and mission, they share one important characteristic in common: all of them are small. With fewer than 200 students enrolled, these schools provide a level of intimacy and support to students that is rare to find in most of our nations high schools. Not only do students at these schools out perform their counterparts at larger high schools in the same districts on standardized tests, but they also have a clearer sense of where they are going after they graduate, and their schools help them to get there. Perhaps most striking of all is the fact that students at these schools actually say that they like the schools they attend, and unlike most high schools, these students they also report that they feel they can confide in the adults who work with them. Several large school districts across the country -- including Boston, Baltimore, New York, and Chicago -- have embarked on initiatives to reform high schools by creating smaller learning communities. Some of these are new schools located in untraditional facilities such as Boston Arts Academy and Fenway Pilot School, both of which are located in warehouse space adjacent to Fenway Park in Boston. Others are smaller units developed within larger traditional high schools and organized around a career-oriented theme such as Communication Arts and Sciences at Berkeley High School and the Health Career Academy at Oakland Technical High School. Many of these new schools have been around for less than five years, but others have a longer history which allows us to learn from their experience. Although the available research is not as detailed or systematic as it should be, several significant findings have emerged that should be used by educators who are contemplating similar initiatives elsewhere. I have outlined some of these in the section that follows. Several researchers have pointed out that the anonymous character of large comprehensive high schools contributes to alienation and a lack of intellectual engagement among students (Steinberg 1996; Newman 1992). In the traditional high school, the average teacher may see as many as 150-175 students during six 45-50 minute class periods. In such a context, teacher-student relations and the overall quality of the academic experience invariably suffer. However, while it is clear that the structure and organization of large comprehensive high schools make them prone to a host of problems (e.g., disengagement, violence, fragmentation, etc. ), it is not the case that all small schools are necessarily better than large ones. There are far too many examples of bad small schools. I worked closely with one in Berkeley, California for several years. For years it served as a dumping ground for students who were regarded as undesirable by traditional schools. Despite its size (officially 160 but attendance barely reached 100 on most days), there was little if any evidence that the school was providing its students with the educational opportunities they deserved. Reducing the size of a school is a necessary but not sufficient step toward improving school quality. Beyond size, all schools must have a clear mission that is understood and meaningful to teachers, students and parents (Meier 1995). Teachers must be skilled and knowledgeable in the subjects they teach, and students must be encouraged to take responsibility for their own learning. Basically, unless all of the essential features associated with school effectiveness (Edmonds, 1979; Sizemore, 1988) are present in small schools, they are unlikely to be any better than the big schools we presently have. In the rush to do something about the failure of high schools, several school districts have attempted to require schools to move toward the development of small learning communities. Even when the reasoning behind this initiative is neither fully understood or embraced, some administrators have required that changes proceed anyway, largely out of a sense of impatience with the status quo. Most people who have worked in public schools immediately grasp the wisdom behind Sarasons point. Schools are not like other organizations (i.e. businesses, universities, or the military) that can be moved and changed by directives from a central executive. Schools are decentralized, loosely coupled (Fullan and Miles 1992) institutions that have their own unique culture and climate. Unless reformers work with educators to adopt changes in the way schools are run, and unless those who work there feel some degree of ownership and responsibility over their work, even the best ideas can be sabotaged or made unworkable. Instead of imposing small learning communities on schools, it is more prudent and effective for educational leaders to work with teachers in conceiving of new schools through a process that is voluntary, creative and organic. When educators are united around a common theme or idea, as has occurred at several charter schools, the sense of ownership and responsibility over the work they do is greatly enhanced. Rather than passively complying (or not) with directives from District-level administrators, educators who are empowered and enabled to create new schools bring a sense of passion to their work that can make extraordinary things happen (Meier 1994; Clinchy 2000). The benefits gained from the opportunity to explore and innovate when creating new schools is precisely what many stagnant systems need to improve. Of course, even as school systems embark on small school initiatives, district leaders must still play a role in insuring some degree of quality control, particularly with respect to issues related to equity, access and the maintenance of academic standards. Not all advocates of new schools agree with this point, but I feel strongly that even as schools are given greater autonomy they must still be held accountable for the academic outcomes of their students. Site councils or boards can and should also play a role in holding educators accountable, and these bodies should include parents. However, professional educators can also play a role in insuring that academic standards and student achievement does not decline as autonomy increases. Additionally, as we have already seen with many charter schools, the creation of new schools can easily lead to schools that are more segregated in terms of race and class (Wells). Similarly, in many districts, magnet schools are used to draw children from affluent families into public school systems even though it often means that they will be separated and educated under different circumstances than children from economically disadvantaged families (Fuller and Elmore 1996). Unless steps are taken to insure that re-segregation does not occur, new small learning communities can become isolated enclaves, both in terms of race and class. Additionally, past experience with some of the educational reforms that were attempted during the 1960s and 1970s has shown (Kirp 1980) that unless schools are held accountable for maintaining academic standards, some new experimental schools will run adrift. Without some monitoring of the quality of academic programs, some educators will pursue fads and gimmicks in the name of innovation that harm students in the long run. The good intentions of educators may not be good enough to insure quality, and the notion that parents who are unsatisfied can vote with their feet and leave if they dont like the education their students receive places too much of a burden on parents to monitor school quality. District leaders have a responsibility to monitor academic quality at newly created schools. This need not mean that they dictate the content of the curriculum, control hiring practices, or require new schools to administer district or state sponsored assessments. Those charged with designing and creating new schools should be granted the freedom and flexibility to do so with as few restrictions as possible on their creativity. However, District officials must take steps to insure that students are being well served in these new schools, and they must do so by carefully monitoring academic outcomes. The criteria by which success will be measured can be subject to negotiation between the new schools and district leaders, but it is very important that a clear criteria is established. Without clear measures related to student performance outcomes there will be no way of knowing if the new schools are successful, and replication of their success will be much more difficult. As policy makers and educational leaders consider various ways to improve and reform schools, it is important that we keep in mind what is at stake and why change is needed. At many schools and districts across the country, especially in communities where the majority of children are poor and non-white, students are not being provided the educational opportunities that they need and deserve. A broad range of academic performance indicators suggests that many of these students will not attain the skills they will need to gain access to a college education or to obtain well paying jobs. Education is the only hope most families have of breaking the cycle of poverty that reproduces itself across generations, and this hope is not being nurtured or realized at many schools. Reforming our nations schools is essential if we are to provide our most vulnerable students with the support they need, and if we are to disrupt the reproduction of failure. A vast body of research has shown that investments in education are the most effective means to deter crime and lower incarceration rates (Currie, 1993), to reduce poverty and unemployment (Danziger, et al. 1994), and to combat disease and to promote public health and welfare (Auerbach and Krimgold 2001). Our nation has the resources and technical capacity to deliver high quality education to all students. The only unanswered question is do we have the will? The answer to that question will ultimately determine whether or not current efforts to reform schools will lead to sustained improvement or produce little more than cosmetic change that does little to alter academic outcomes. Public cynicism and frustration with the pace and progress of reform is growing, and calls for the complete dismantling of public education through various privatization schemes are gaining momentum. Those of us who truly believe that public education is an essential feature of a healthy democracy must undertake our work with a sense of urgency and deliberateness. As we do so we must also recognize that how successful we are in our current efforts will determine the kind of society in which we will live in the future. 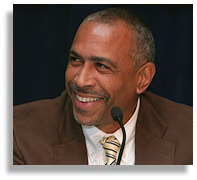 Pedro A. Noguera is a professor at New York Universitys Steinhardt School of Education. Published in In Motion Magazine August 8, 2004.